Discussion in 'Legacy GameMaker Community Tech Support' started by nyancats1993, Feb 4, 2019. So recently I've been having an issue with both the installer/updater and the compiler. To start i'm on windows 7 64bit with a completely fresh install short of all the visual studios, direct x, java, etc. 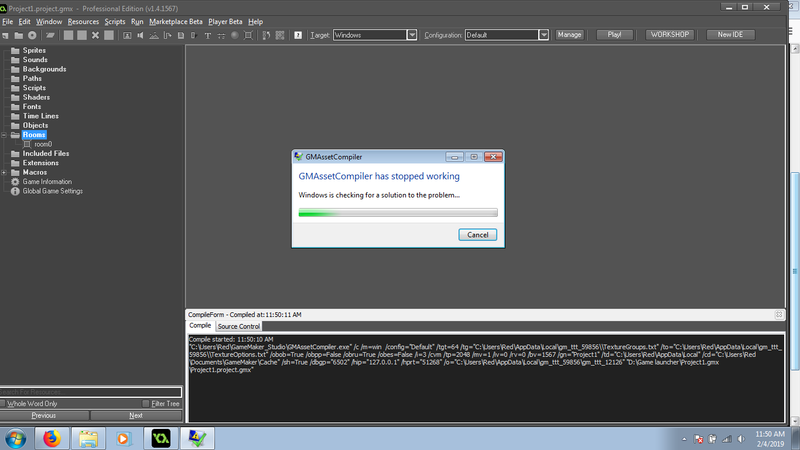 About 6 months ago Game maker worked perfectly fine on the same computer, i tried to run it again a week ago and got this error even with a blank room. So i figured it was time for a fresh install of windows. Although I'm still getting the same issues. "C:\Users\Red\GameMaker_Studio\GMAssetCompiler.exe" /c /m=win /config="Default" /tgt=64 /tg="C:\Users\Red\AppData\Local\gm_ttt_59856\\TextureGroups.txt" /to="C:\Users\Red\AppData\Local\gm_ttt_59856\\TextureOptions.txt" /obob=True /obpp=False /obru=True /obes=False /i=3 /cvm /tp=2048 /mv=1 /iv=0 /rv=0 /bv=1567 /gn="Project1" /td="C:\Users\Red\AppData\Local" /cd="C:\Users\Red\Documents\GameMaker\Cache" /sh=True /dbgp="6502" /hip="127.0.0.1" /hprt="51268" /o="C:\Users\Red\AppData\Local\gm_ttt_59856\gm_ttt_12126" "D:\Game launcher\Project1.gmx\Project1.project.gmx"
Unhandled Exception: System.IO.FileNotFoundException: Could not load file or assembly 'System.Windows.Forms, Version=2.0.0.0, Culture=neutral, PublicKeyToken=b77a5c561934e089' or one of its dependencies. The system cannot find the file specified. So after having these issues I figured there was a program or runtime I was missing so I tried to run the windows installer for the trial version. But after it installs I try to run it which starts the update process and that crashes as well. every other program on my computer seems to work flawlessly why is GM running so poorly these days? Actually it may have something to do with the un-found SDKs. Yet even though I've installed all the visual studios I'm still missing the "C:\Program Files (x86)\Windows Kits\8.0" and "C:\Program Files (x86)\Microsoft Visual Studio 11.0" and the link GM has for the required files was removed from microsofts servers. Maybe that's where I should stat? anyone have a link for this? Nevermin it was a missing dll in windows 7, had to upgrade to windows 10. Not sure which otherwise I'd link it for you people in the future.